The Port of Roscoff infrastructures are of very high quality. Access for disabled persons has been particularly well thought out. Perhaps you've come from afar? You're stopping off and wish to explore the continent or the Bay of Morlaix? Well that's no problem. In fact it's quite simple! Conveniently situated between Aber Wrach and Trebeurden, Roscoff Marina is the perfect place to stop while waiting for a tide. It's a stop-over port for yachts sailing through the Channel, whether heading towards Great Britain, Ireland, Belgium, the Netherlands... or going south, and soon to be facing the difficulties of the Iroise Sea. It is also a good place to stay for a bit, and enjoy the wonderful scenery surrounding the Bay of Morlaix, both on land and out to sea. Huge free car park, unmanned. The city of Morlaix and its marina (20 mins away), Brest (50 mins) and Rennes (2 1/2 hrs) can be reached from Roscoff by toll-free express roads. TGV high speed trains stop at the Brest and Morlaix railway stations. In 2015, the TGV will reduce travel time from the tip of Brittany to Paris to less than 3 hours. TER regional trains and coaches offer a regular service between the Roscoff and Morlaix railway stations. Brest Bretagne International Airport (45 mins away) offers numerous routes to major French and European towns and cities. The hostess can inform you at Roscoff marina office. An information window is open in the marine railway station. The Roscoff city centre tourist office welcomes visitors all year round. 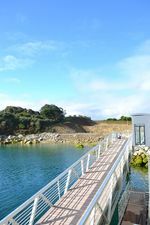 a lift specifically for disabled persons provides access to the jetties, whatever the water level - a world first for a tidal port!